Hopefully many of you have seen or plan to see our newest Eyelights gallery exhibition that opened on the 24th of September. Uniformity: Cracking the Dress Code features uniforms worn in various contexts—school, church, battlefield, rugby field, and even those worn on the street. A previous post about Uniformity talked about the role that outside organisations had in ensuring that the uniforms on display were presented correctly. In this exhibition we worked with not just the New Zealand Special Air Service Defense Group (SAS) , but the office of the Governor General and a private firearms collector; we also had a staff member who had worn one of the school uniforms on display. Curators worked to find archival images, such as one of Adele Howlson, Wellington Technical College student, to make sure that our approach to display of the garments was as informed as possible. As the conservator assigned to the exhibition, I was responsible for translating these images (and video footage) into a correct and effective final “look”. So once we had a good idea of what a uniform should look like on display, what was done to achieve that? A highlight of the Uniformity exhibition is Corporal Willie Apiata, VC’s combat uniform from Afghanistan. Corporal Apiata became the first recipient of the Victoria Cross for New Zealand in 2007. The Victoria Cross is the highest military award for an act of bravery, and Corporal Apiata received it for his actions in Afghanistan in 2004, in which he carried a wounded soldier across a battlefield, under fire, to safety. 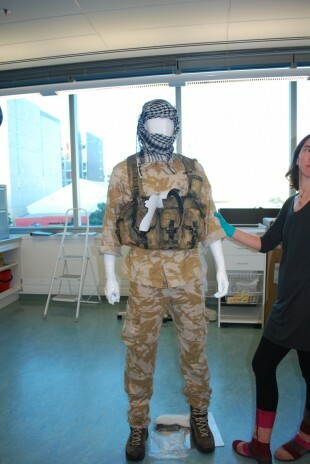 For the display of Corporal Willie Apiata, VC’s uniform, the choice of a full body fibreglass fashion mannequin (rather than a dressmaker’s dummy) was dictated primarily by the existence of several components like shemagh (headscarf), boots, gloves, and weaponry, that all called for a sturdy and lifelike display form with hands, feet and head. However, a great deal of modification of the form was required. When Corporal Apiata consulted with us about the display, we talked with him about various details like what he would have carried in his pockets, how he would have rolled his sleeves, worn his hunting knife and the firearms. Corporal Apiata also showed us how to tie the headscarf. At the end of our meeting, I measured across Corporal Apiata’s back, and found that the mannequin was 10 cm narrower from shoulder to shoulder than Corporal Apiata. Uniform of Corporal Willie Apiata, VC dressed on its mannequin without any modifications. The mannequin was about 10 cm narrower between the shoulders than Corporal Apiata, and slightly taller than him. Image copyright Te Papa. Based on that consultation and further collaboration with the SAS, the display mannequin was modified to achieve a more correct presentation. Dacron polyester wadding was layered between two undershirts on top and between black tights and thermal underwear on the bottom of the mannequin, using anatomical drawings of muscles to shape and position the Dacron. 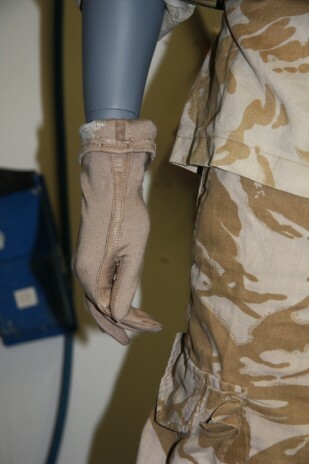 The mannequin had to then be adapted to fit Corporal Apiata’s gloves, which could not be put on to the hands of the form because its fingers were fused. Object Support Mountmaker Penny Angrick cut the fingers off the fibreglass form and constructed new ones using armature wire, foam and cotton gloves. Mannequin hands with rebuilt fingers constructed of armature wire and archival foam. Image copyright Te Papa. The new hands not only enable the gloves to be displayed on the mannequin, but they also enable the fingers to be articulated into more lifelike positions, making the display a little more dynamic. 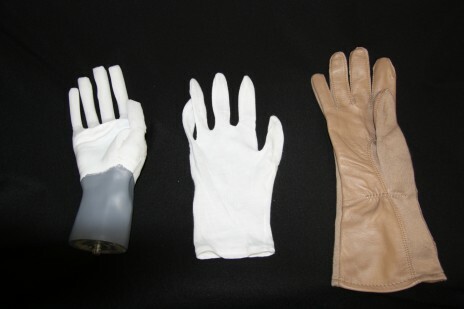 Detail of the glove after the modification of the display mannequin. Image copyright Te Papa. Finally, the mannequin required modifications to accomodate mounts for the M4 rifle and replica P226 pistol. Because of the weight of the firearms, and security concerns (even though neither is a functional weapon), these were to be displayed on the body form supported and secured in place with locking mounts. These mounts consisted of welded metal parts attached to the mannequin itself. So Penny made large cavities in the mannequin to accomodate them, as well as making the mounts themselves (she also had to get a firearms license). 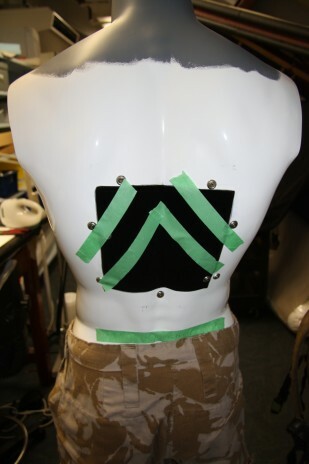 The display mannequin with a cavity cut out, to accomodate the required locking mounts for the firearms and to enable the mannequin to be screwed to the back wall of the case. Image copyright Te Papa. There was actually very little conservation that was done on Corporal Apiata’s uniform. The shirt has a large hole in it at the front, but it was decided to treat that as historically important evidence of the battlefield conditions, and I did not patch or stabilise the hole. Many other aspects of the uniform’s condition, such as creases and thinning fabric and the knees, were similarly handled with care but not treated, for the same reason. UNIFORMS, am all for Uniforms, they identify folk, be it Army, nursing. School or groups… My job back in London was fitting school chilldren for schools, one group were for the children with ones with limbs missing, or burnt skin… this is when the new VELCRO came into being, we would have uniform made up and instead of buttons as many couldnt do them up, we used velcro and they could push again a door or wall and it was do up the garment for them.. Look how much smarter folk are in Uniforms instead of mufti. they are proud to say who they are or what they do… I have an old blue gabardine raincoat, Queen Margaret one, perhaps I should donate it to Te Papa, I bought it as loved it, not my school, I am from London.. Look how smart nurses used to look in uniform with a nurse cap on to finish it off, I have a photograph of my late Grandmother in long uniform.. lovely.. and Ellen Dougherty, First Registered Nurse in the World, I have her photograph, in fact have all her history here at Clareville. Uniforms.. great idea.. remember gloves with your uniform and hats? Schools are not as smart these days without these items… must get down to Te Papa….